Top row, left to right are Lisa Napier, Eddie Stacks and Ryan Iachini. Second row, left to right are Mitch Piper, Jeremy Laubach and Brandon Gordon. 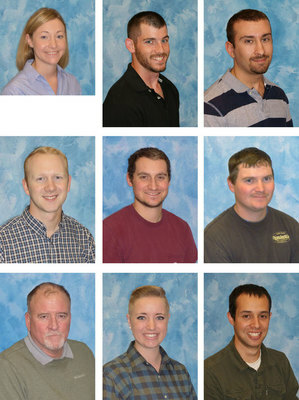 Third row, left to right are Ross Holsclaw, Bekah Hatheway and Richie Turschmann. Covington, VA (August 31, 2018) - WestRock’s Alleghany Highlands Operations announces position changes that were internally announced in the second quarter. Lisa Napier has accepted the position of Maintenance and Engineering analyst. In this position, she is responsible for working with the Maintenance, Finance, and Engineering departments to resolve accounts payable issues, helping with WNS / TRAC transition, and mill-wide service entries. Napier earned her B.S. in Foods and Nutrition from Radford University in 2009. She accepted the position of dietary manager at Bath County Hospital in 2010, then worked as CQC representative and lab tester through Manpower at the Covington mill beginning in 2013. Napier joined the mill as a full-time employee in September 2014 when she assumed the position of analytical services administrative assistant. In December 2015, Napier accepted the position of senior administrative assistant. Eddie Stacks has accepted the position of process engineer on No. 1 Paper Machine. In this position, he is responsible for supporting equipment strategies as well as long-term improvement projects. Stacks earned his B.S. degree in Mechanical Engineering Technology from Bluefield State College in May 2013 and worked as an odorization technician at Midland Resource Recovery beginning in October 2013. Stacks joined the mill in June 2015 as a process engineer in the Technical department where he rotated through No. 8 Paper Machine and the Recovery department. Ryan Iachini has accepted the position of recausticizing engineer in the Recovery department. In this position, he is responsible for maintaining the safety, production, reliability, and quality of slakers, recausticizers, and lime kiln systems, as well as coordinating improvement projects and the planning/execution of outages in the recausticizing area. Iachini earned his B.S. degrees in Chemical Engineering and Chemistry from Virginia Tech in May 2014. Prior to his employment at WestRock, he was the fuel nozzle repair co-op at GE Energy in Greenville, South Carolina, from August - December 2011 and August - December 2012. Iachini joined WestRock in 2014 as an Early Career Development engineer and spent his first rotation at the Covington mill in the Recovery department. He served additional rotational assignments in Logistics and at Evadale before taking a full time position at the Covington mill as a process engineer in the Recovery department in October 2016. Mitch Piper has accepted the position of recovery boiler supervisor. In this position, he is responsible for maintaining the safety, production, and quality of the recovery boilers, as well as the planning and execution of major recovery boiler outages. Piper earned his B.S. degree in Chemical Engineering from Pennsylvania State University in 2013. Prior to his employment at WestRock, Mitch completed an internship in 2012 at First Quality Enterprises, Inc. as a process engineer. He joined the Covington mill in 2013 as a process engineer in the Technical department and rotated through No. 2 Paper Machine before accepting the position of recausticizing process engineer in the Recovery department in 2014. Mitch was promoted to recausticizing supervisor in May 2017. Jeremy Laubach has accepted the position of dry-end engineer on No. 1 Paper Machine. In this position, he is responsible for safety coordination, production, and quality on the dry-end. Additionally, Laubach will assist the project engineer on winder activities and coordinate maintenance operations, including daily and scheduled outages, through the validator. Laubach earned his B.S. degree in Chemical Engineering from Virginia Tech in May 2014 and was a co-op at the Covington mill in the Stock and Additives department from May - December 2012. In July 2014, he was hired full-time as a process engineer in the Technical department where he rotated through the Stock and Additives department. He accepted the position of process engineer on No. 1 Paper Machine in March 2015. Brandon Gordonhas accepted the position of step-up tour leader in Plant Security. In this position, he is responsible for conducting perimeter checks, taking first aid and fire calls, investigating incidents in the mill, and checking hose stations, alarms, and extinguishers. Gordon received his A.A.S. degree in Administrative Justice and Unarmed Security from Dabney S. Lancaster Community College. Ross Holsclaw has accepted the position of supervisor / planner in Maintenance. In this position, he is responsible for mechanical maintenance in Recovery and caustic works in Area III. Ross will handle daily planned and scheduled maintenance along with the break-in work. Holsclaw began his career at the Covington mill in 1988 as a maintenance planner and was promoted to maintenance foreman in 1989. He transferred to Environmental Services as an environmental services foreman in 1994 and transferred back to Maintenance as a foreman in 1999. In 2006, Holsclaw joined Perdue Farms Inc. as a maintenance superintendent in Milford, Delaware before accepting the position of paper mill maintenance supervisor at Smurfit-Stone Container Corporation in Florence, South Carolina, in 2007. From 2008 until September 2011, Holsclaw worked as a fiberline maintenance supervisor at Georgia-Pacific in Palatka, Florida. He returned to the Covington mill in November 2011 as UPM maintenance supervisor. In November 2013, Holsclaw accepted the position of Power and Recovery maintenance supervisor with RockTenn in West Point, Virginia. Bekah Hatheway has accepted the position of financial analyst in the Finance department. In this position, she is responsible for posting all journal entries as part of the month-end closing process and will complete various monthly and quarterly financial reports. Hatheway will also support the finance team in developing new reporting tools as a result of the JDE conversion in addition to other month-end close tasks. Hatheway received her B.A. in Accounting from Anderson University in 2013. She began her career at Wendover Art Group in Largo, Florida as an accounting specialist in June 2013. Richie Turschmann has accepted the position of capital projects analyst in the Engineering department. In this position, he is responsible for providing support for major capital project controls and capital project scheduling. Richie is the primary analyst for the C1 Strategic Upgrades project and the RB1 Precipitator upgrade. Turschmann received his B.S. in Chemical Engineering from WVU Institute of Technology in 2012 and his MBA from Liberty University in 2016. He joined the Covington mill in June 2012 as a process engineer for the Technical department and rotated through No. 1 Paper Machine and the Fiberline department. After the rotational program, he accepted a full-time position in the Woodyard in 2014 and transitioned to the Bleach Room in 2015. In 2017, Turschmann joined the Finance department as lead financial analyst.